This page created 5th April 2000. The Dennis Lances with Plaxton Verde bodies were not the first Dennis Lance buses used in London. There had been some in the thirties, double-deckers with ST-style bodies. But also, in 1991 Dennis had resurrected the Lance name for its new large single-decker bus chassis, and London Buses had bought 16, fitted with Alexander bodies, to replace Routemasters on the 36B: the LA class. They were not an unalloyed success, mainly due to their length and lack of manoeuvrability. But in 1994 London Buses bought another batch of Dennis Lances, fitting them this time with stylish Plaxton Verde bodies. 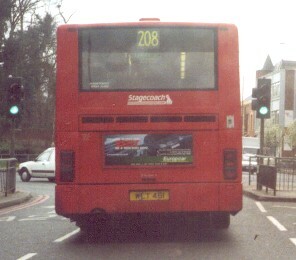 These 11-metre buses were also sent to Catford garage, but were assigned duties on a suburban route, the 208. Like the previous Lances, they wore a spectacular livery of red, white, black and grey. The twelve LVs started work on the 208, but again were not as successful as hoped. 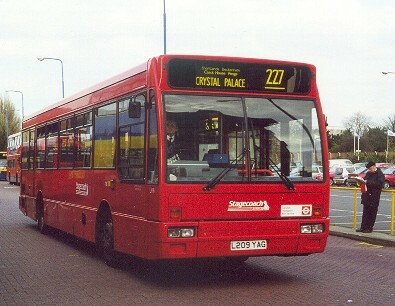 At the end of 1994 they were taken over by Stagecoach as part of the Selkent division privatisation. Selkent officially transferred them to the 75 route, but in practice they continued to be used on the 208 between Catford and Orpington. 1995-6 saw them repainted plain red. November 1997 saw them transferred to Bromley to work the short but busy 227 between Bromley North and Crystal Palace, when Stagecoach took over the contract from Kentish Bus in a rationalisation deal. 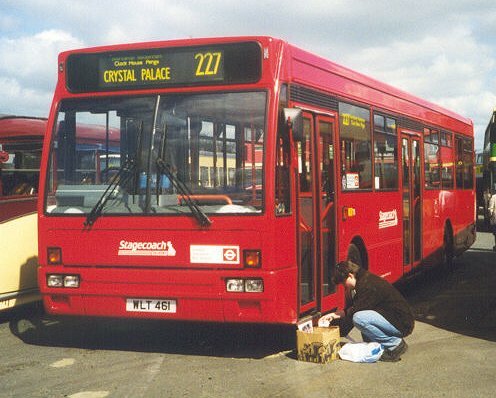 March 2000 saw them still at work on the 227 - and sometimes the 208 - but faced with replacement by low-floor buses without the split entrance in accordance with retendering requirements. All except LV8 were transferred during 2000 to Stagecoach South-East, and spent two years in East Kent and East Sussex. April 2002 onwards saw many of them on loan at various times to Eastbourne Buses, until they all moved north (together with LV8 which had languished in the yard at Bromley) to Stagecoach North-West at Carlisle, during August and September 2002. Disaster inundated them (literally) in January 2005, when a swollen River Eden burst its banks in Carlisle and doused them in sewage. Stagecoach wrote off the contaminated vehicles (ie all of them), but some were reclaimed by T&NL Harvey at Hixon Airfield and found further employment, notably with the Birmingham Coach Company. March 2000: LV12 makes a foray on the 208, instead of a Titan. Rather scruffy LV4 leaves Bromley North station for a trip to Crystal Palace on the 227, March 2000. Ian's Bus Stop LN . LV text. LV bus histories. LV photo refs. LS/DL .